AKIPRESS.COM - The secrets behind the construction of the oldest and only survivor of the Seven Wonders of the World have been locked within its limestone and granite walls for centuries. 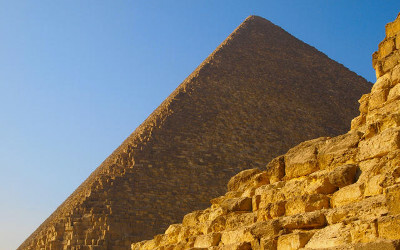 But now archaeologists believe they have finally uncovered how Egyptians were able to lug millions of 2.5 ton blocks 500 miles to create the Great Pyramid of Giza, The Mirror reported. Built as a tomb for Pharaoh Khufu in about 2,600BC over 20 years, the 481ft tall structure was the largest of all the pyramids and was, until the Middle Ages, the tallest man-made construction on Earth. Historians have long argued how 800 tonnes of material was transported to Giza from Aswan every day. Now the discovery of an ancient papyrus, a ceremonial boat, and a system of waterworks could finally put an end to the debate. New evidence reveals thousands of labourers transported 170,000 tonnes of limestone along the Nile in wooden boats, held together by ropes, through a specially constructed system of canals, reports the Mail on Sunday . The ancient scroll was discovered in the seaport Wadi Al-Jarf and is the only firsthand account on record of how the pyramids were built. Written by an overseer named Merer, it reveals some 2.3 million blocks were ferried to an inland port built just yards away from the base of the pyramid.